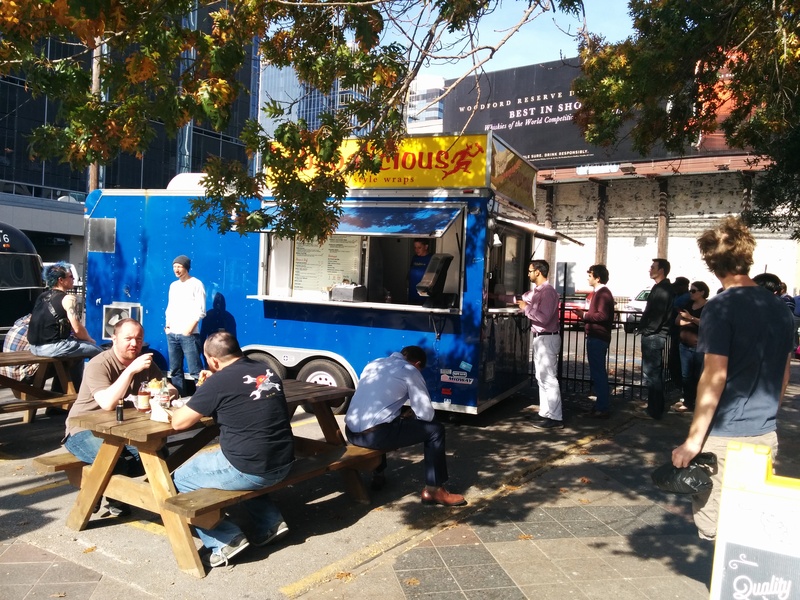 Over the last decade, Austin has exploded with a food truck revolution. They are so popular that temporary food truck installations on empty lots are mourned when the lot becomes ready for development and the trucks move on. But, taste aside, why do they do so well? What can we learn from them? Cheap picnic benches, Christmas lighting, and disposable dishes form a popular Austin style. Restaurants are notoriously risky businesses to start. Many people start this way because food is their passion, but discover that making delicious food is only one of many components to running a successful restaurant. Food trucks are an opportunity to start your own restaurant at a smaller scale, and with lower costs. Budding restaurateurs can refine their menu, learn the ropes, and figure out whether they’re cut out for this industry without blowing their entire life savings. Today, Kebabalicious retains a truck location as well as a brick and mortar location. Lenders know that restaurants fail often; this makes them hesitant to fund new ones. By giving owners a chance to prove themselves and their ability to successfully manage a business, food trucks provide a way for lenders to separate the wheat from the chaff prior to making a large loan. This means some restaurants can get funding that would never have received it otherwise. 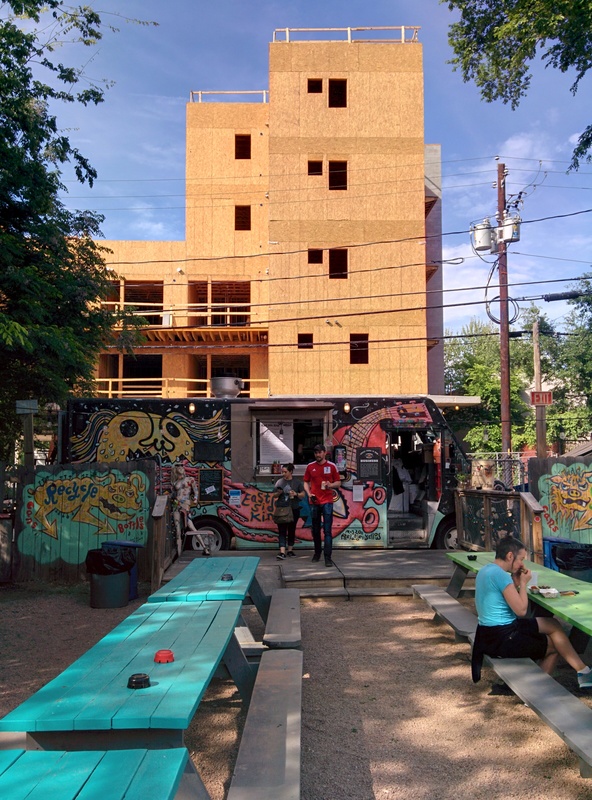 Austin has seen dozens of restaurants that started as food trucks, before eventually finding brick-and-mortar premises. 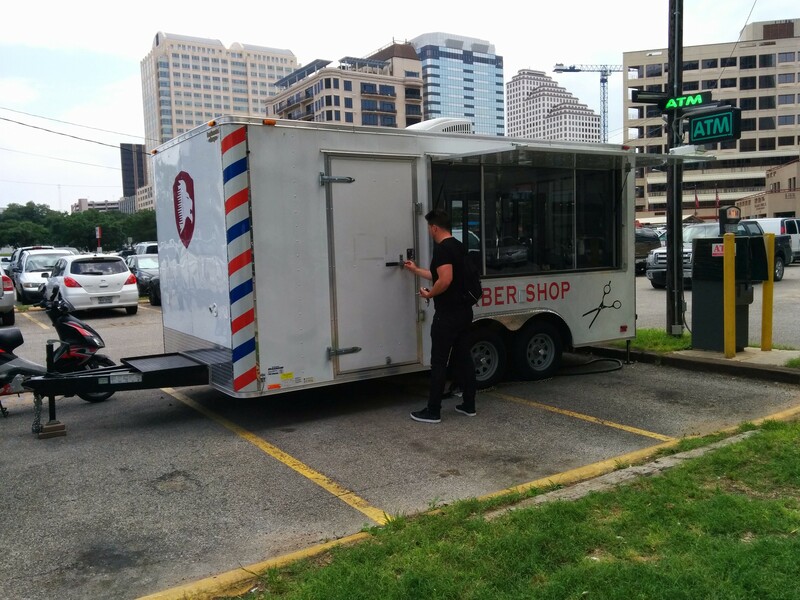 The “food truck” economy has spread to other goods and services, like this barbershop-in-a-trailer. Food trucks are regulated in how they prepare their food, where they may locate, and what kind of signage they can use. However, their regulations are both lighter and more directly related to their business than the regulations for brick-and-mortar businesses. If a food truck on a small lot with some picnic benches decided they would rather build a permanent building with indoor seating, they not only must still comply with the health and safety regulations the city requires; they would also have to provide parking. For some food truck lots with multiple vendors, even if they had the money and desire to reconstitute themselves as brick and mortar restaurants, they couldn’t do it on the same site because of parking requirements. By avoiding these, food trucks can persevere in high-traffic locations. The East Side King food truck, pictured here in the backyard of the bar Liberty, was created by local celebrity chef Paul Qui. One of the more interesting developments in the food truck industry is their co-location with bars. 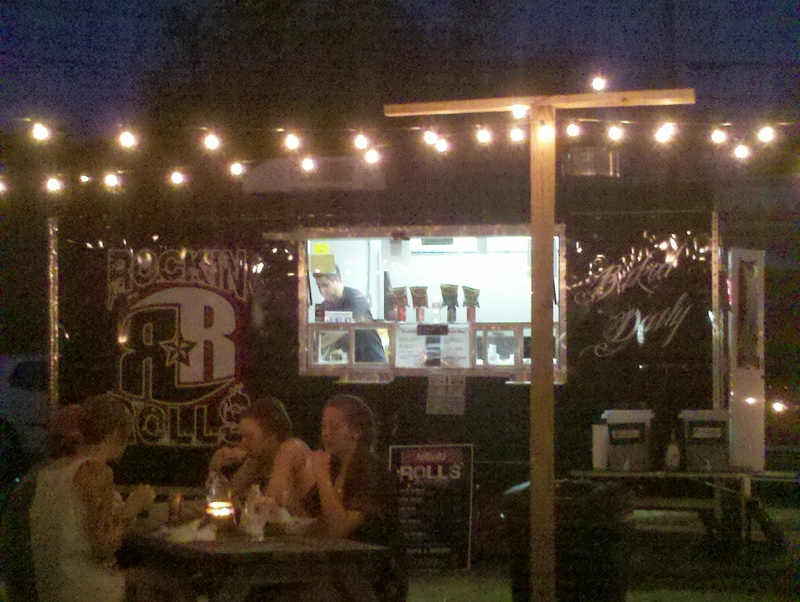 Many bars, especially in the East 6th and Rainey districts, have backyard food trucks. The two businesses can focus on their core competencies, while complementing one another. Having food available near where alcohol is served is also a public health benefit, especially in an alcohol- and driving-friendly city like Austin. After a failed attempt to open a brick-and-mortar location in this downtown building, Chi’lantro occupied a formerly underused entryway. 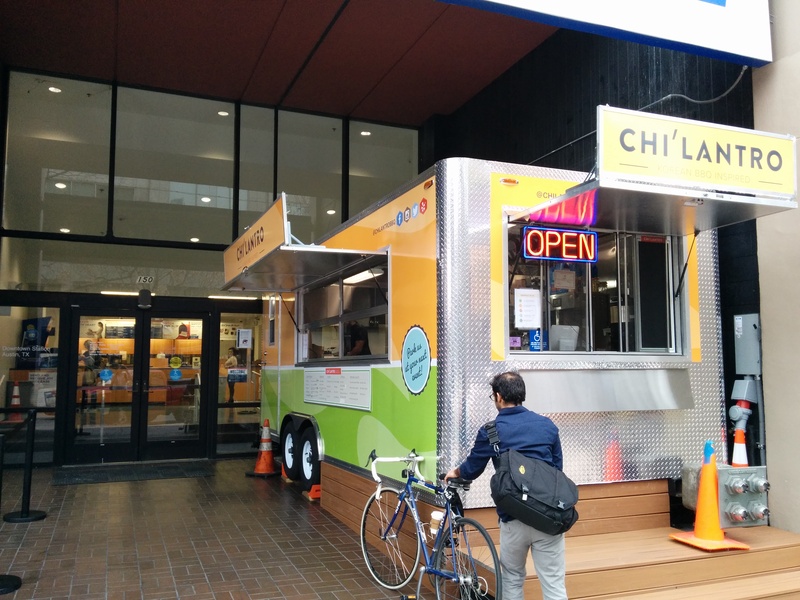 Food trucks, small as they are, can fit in places other restaurants couldn’t. They seek out and find underutilized areas throughout the city, from dirt lots waiting on building permits to underused parking lots and plazas that have been mandated into place by city zoning rules. They are an indicator species for land with unmet commercial demand, and where they meet that demand, they incrementally improve our city one taco at a time. Pretty much every Austinite I know loves food trucks. But many of the things that make them wonderful could be available to us indoors as well! Many of the storefronts on our old commercial streets, like Congress Avenue or East 6th, were barely wider than a food truck and served walk-up customers without providing any automobile parking. In this sense, food trucks are less a modern innovation, but a throwback to an earlier time before cars and regulations spread the city out. Their popularity shows that the demand for this kind of city is still very much present. We ought to let people fill that demand in trucks or buildings, with or without parking. I like food trucks but if they pop up everywhere, it’s a sign your city has regulatory problems (it’s a bug, not a feature). There are many food trailers which stay as food trailers long after the experimentation period has ended, in other words (perhaps a large majority even). So to me, #3 is #1. In the Boise area, and I’m sure in other places, food trucks and brew-pubs have formed a sort of symbiotic relationship. The breweries can focus on serving their beer without the hassles and bureaucracy of also providing food service. They simply allow the food trucks to setup on their property and provide food to the brewery/bar patrons. A win-win for both industries.